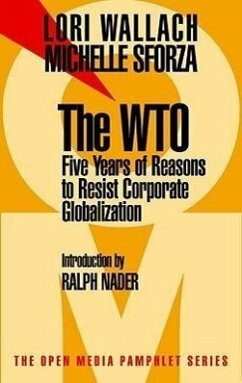 In this groundbreaking pamphlet, directors of Ralph Nader's Public Citizen group examine the first five years of the World Trade Organization's track record, demonstrating how the WTO aims to create a new global economic system that increases corporate profit with little regard for social and ecological impacts, or democratically enacted law. Wallach and Sforza make clear recommendations for altering the undemocratic course that the WTO imposes on democratic society. LORI WALLACH was dubbed "Ralph Nader with a sense of humor" by the Wall Street Journal and "the trade debate's guerilla warrior" by the National Journal. She is a cofounder of the Citizen's Trade Campaign, a national coalition representing over 11 million Americans. An expert on trade policy and international commercial agreements, MICHELLE SFORZA's articles have appeared in the Nation, the Ecologist, and the Multinational Monitor, among other publications.